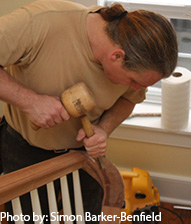 James started Fox Woodworking, LLC (previously LIGNEA) over fifteen years ago. Over those fifteen years, he has built a loyal client base who consistently return for his services on their newest endeavor. He also enjoys meeting new clients as Fox Woodworking continues to grow. If he is not in the shop working on the latest project or in the office planning for the next one, he is probably studying a foreign language and dreaming of his next trip. James finds that the multifaceted environment of running his own business keeps him engaged and energized. There is always a new challenge that presents another opportunity for finding a creative solution. James has been making cabinetry and woodwork for most of his life. His earliest memories are of nailing two boards together and cutting up fallen limbs on a table saw. In addition to woodworking, James also built scale models and repaired lawn mower engines throughout his early school years. His first formal woodworking education was at Kimberton Farms School (now Kimberton Waldorf School). Postponing college, James went to work at Joseph Katz Woodworking, where he was the lead fabricator for five years. While he made a brief detour into the financial and economic worlds, earning an Associate of Business Administration Degree from Ursinus College and a Bachelor's Degree in Mathematical Economics from Temple University - working various night club security gigs to pay the bills - he missed the joy of working with his hands. It was not long before he was back in the shop creating fine cabinetry.